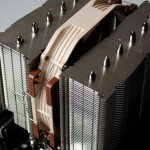 Today I will be taking a look at the Noctua NH-C14S top-flow CPU Cooler. The C14S is the successor to the original C14 and offers almost as good cooling with one fan and the original did with two. 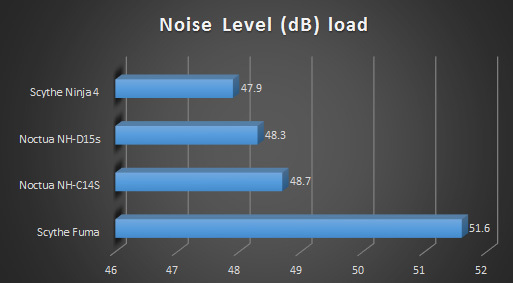 This is possible thanks to the C14S’ deeper fin stack and, of course, the NF-A14 PWM fan included with the cooler. The great thing about the C14s is its versatility and ability to adapt to each individual build it is used in. 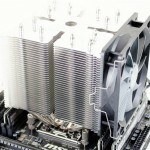 Have ram with taller heatsinks? Maybe you want to put the fan on top. 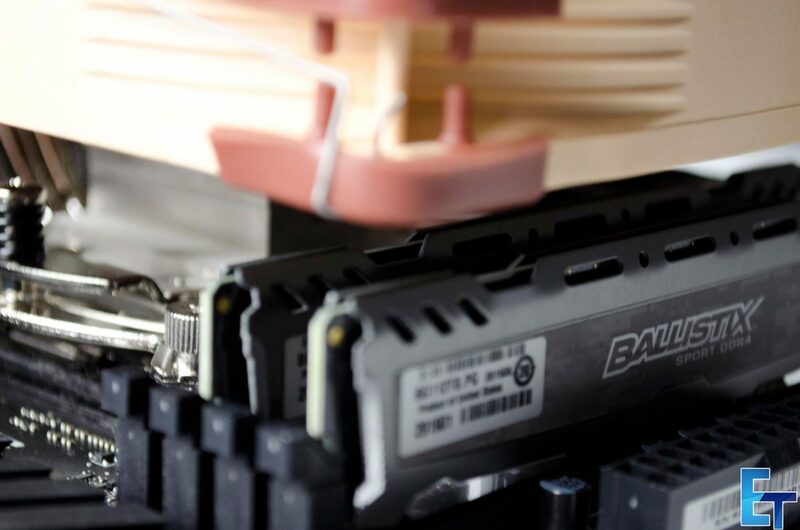 Need to fit it in an m-ITX case? Well, maybe you want to put the fan on the bottom side of the fin array, which when assembled like this, the C14S has a height of only 115mm, making it a very viable HTPC choice. 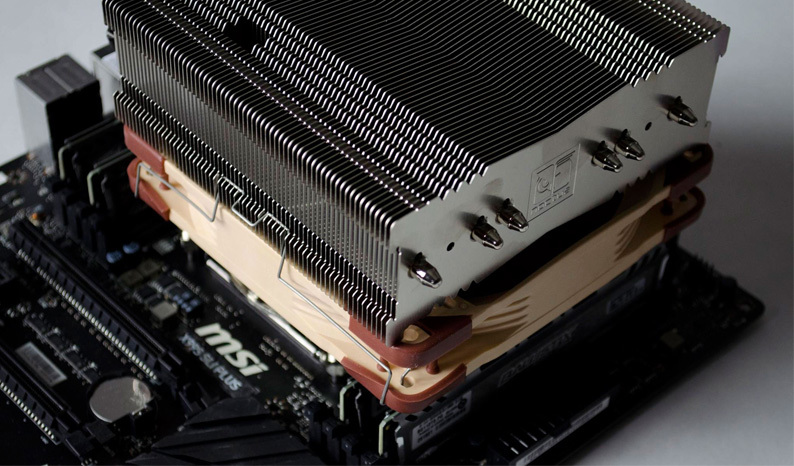 When people hear the name Noctua, they immediately associate it with performance and a unique colour scheme choice for their fans. 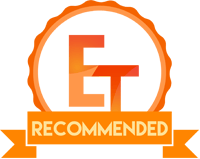 While the colour of the fans can be argued back and forth from a purely aesthetic point of view, there is no denying the performance they offer and have offered over the years. 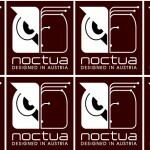 Noctua is a manufacturer who strictly focuses on CPU cooling, whether it be heatsinks, fans or thermal paste they have perfect their craft and shown us time and time again why they are one of the best. 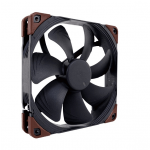 Another thing that helps Noctua’s case for being one of the best CPU cooling companies around are the accessories they include with their coolers. Bundled with all coolers is a nice host of things to make sure you can make the most of your new cooler. As we can see in the image below, which is the accessories for the C14s, we have a screwdriver, three separate installation manuals, all the different screws and spaces to get the cooler installed on most AMD and INTEL sockets, NT-H1 thermal paste, fan retention clips, low noise adapter and a metal case badge! 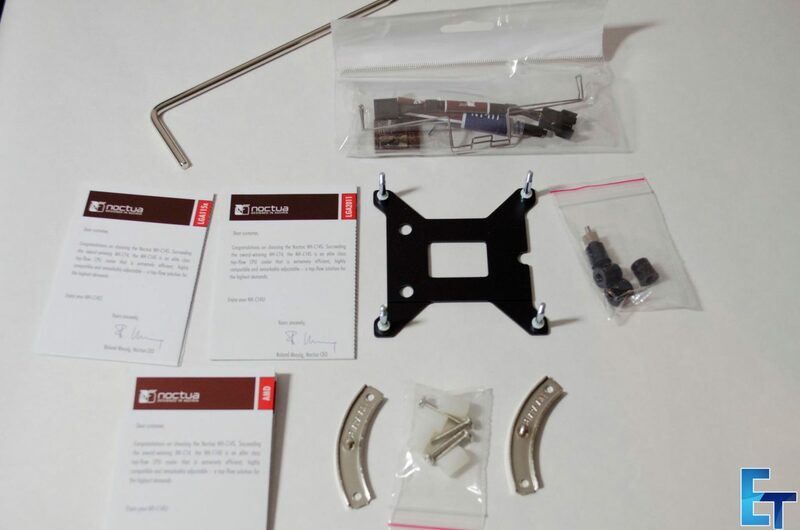 It’s also been said that Noctua is great at supplying mounting kits for those who have purchased coolers and have either lost or damaged them, but I can neither confirm or deny this and I have never had this problem myself. 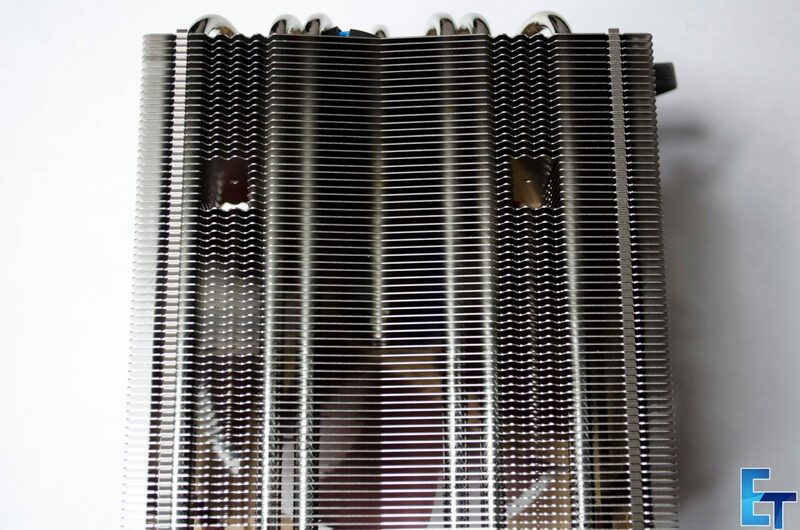 The NH-C14S is a C-type top-flow cooler and as such, the included NF-A14 fan can either be mounted underneath, or, on top of the actual fin array. 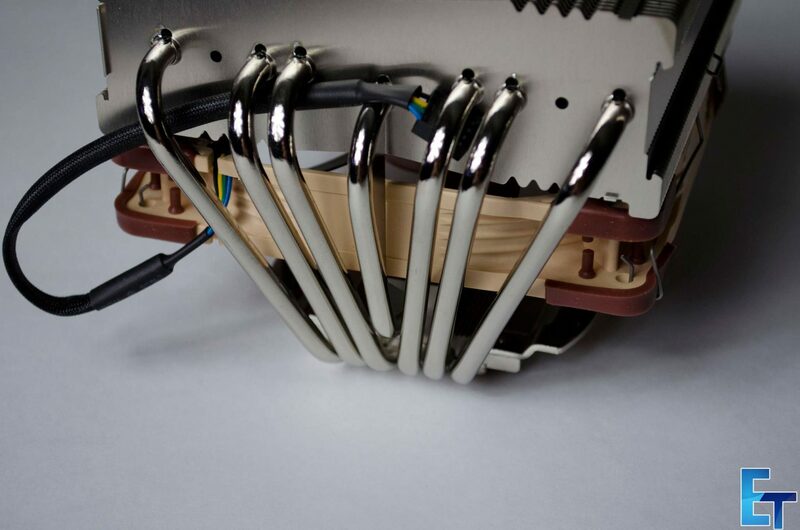 There are six nickel-plated copper heat pipes that pass through the aluminium fin array down to the base, which is all nickel-plated copper to offer some impressive cooling. As mentioned, the fin density on the C14S is deeper than that of the original C14 and allows it to offer some pretty impressive cooling without having to add a second fan to it, though the option is there if you want. 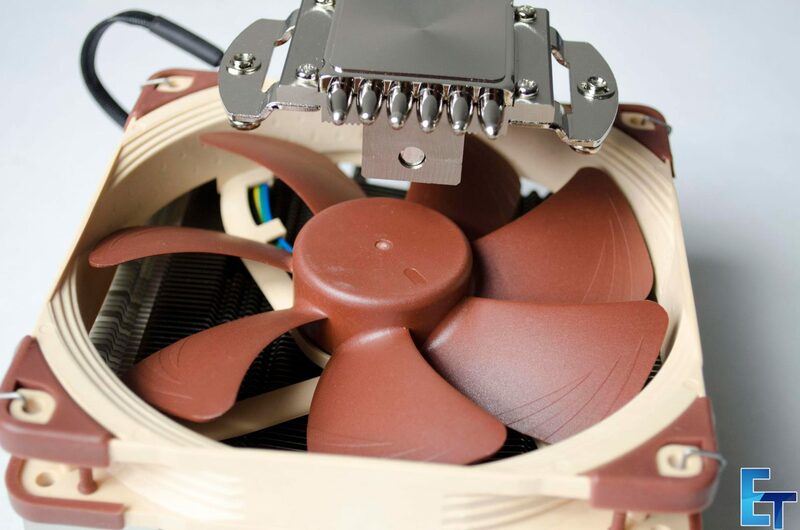 The NF-A14 PWM fan is 140mm with a max RPM of 1500 and features Noctua’s original colour scheme. 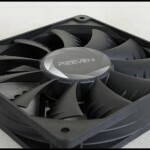 These fans feature the SS02 bearing and have been tried and tested and are truly some of the best consumer grade fans you can buy. Another thing worth notice is these fans have a 150,000 hour MTBF rating, so in theory, you could leave them running 24/7 for 6,250 days or a little over 17 years. Now I am not telling you to go out and try this, as most likely the 6-year warranty would be up before the fan stops functioning but this is a pretty impressive rating to have. 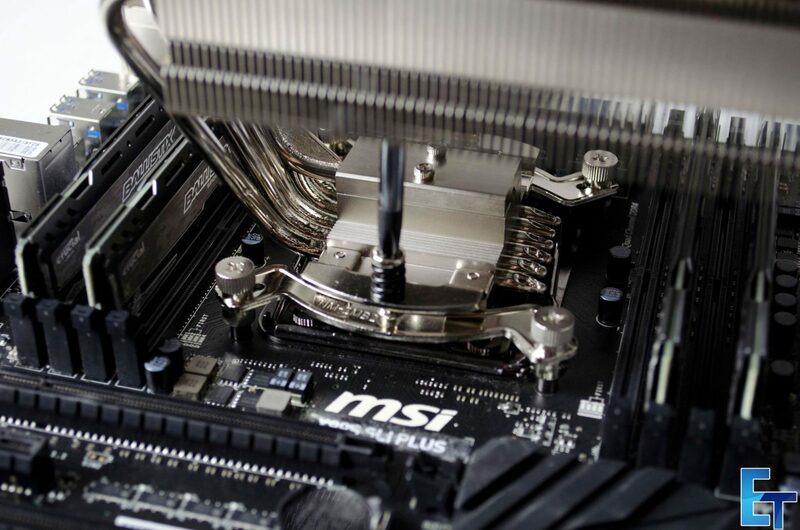 Thanks to Noctua’s SecuFirm2™ Mounting Kit, the C14S can be installed in no time. 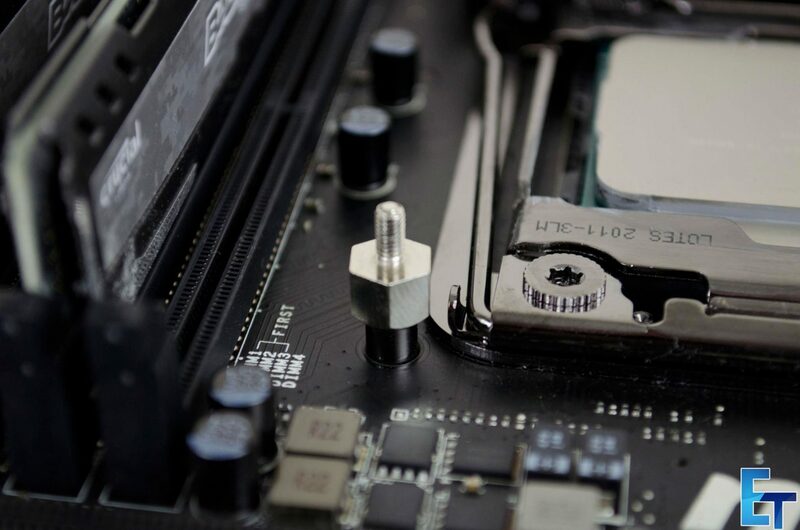 First up, as this is the 2011-V3 socket, go ahead and install the 4x screws, one into each corner of the CPU socket. 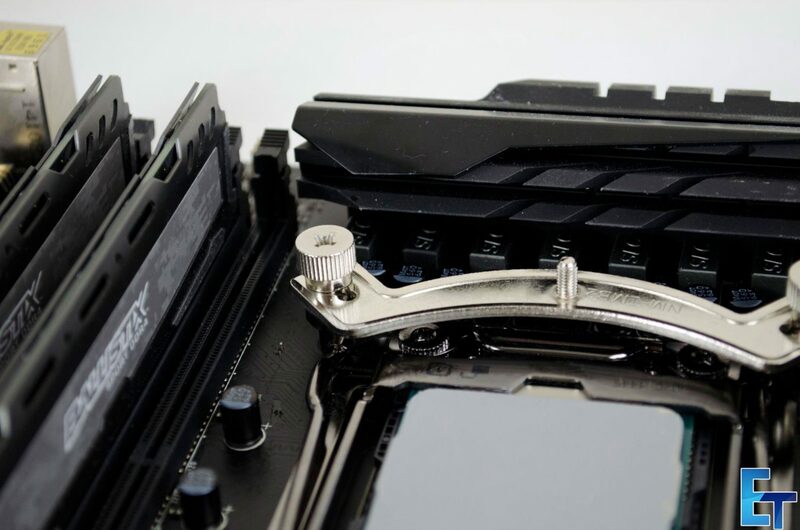 Next, set the CPU cooler retention bracket atop those 4x screws you just installed and use the included thumb screws to secure them into place. 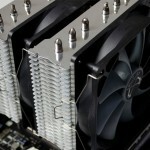 Please make note as to which way you install these brackets as it will effect the coolers orientation once installed. 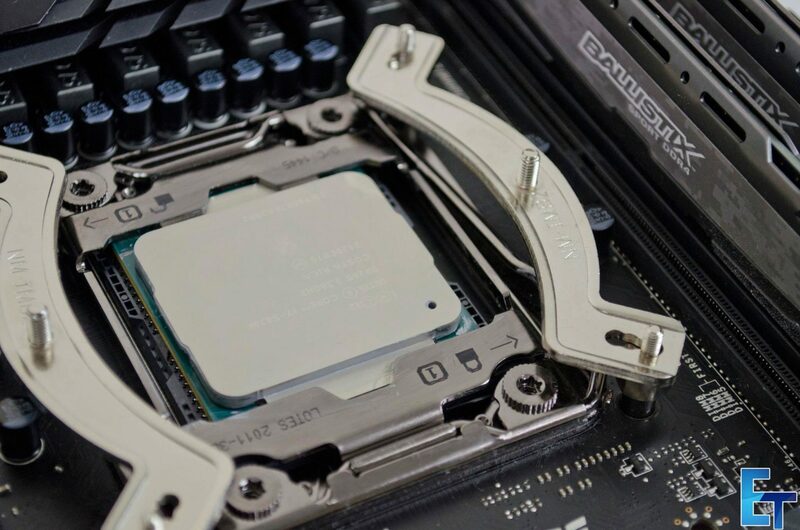 Lastly, go ahead and get some of the included NT-H1 thermal paste installed on the CPU, set the cooler atop the CPU and use the included screwdriver to secure it to the previously installed retention brackets. Job done! As far as RAM clearance goes, with the fan on the underside of the fin array there is a bit of room to play around. Granted my Crucial DDR4 doesn’t have the tallest of heatsinks, but as you can see, there is still a bit of room between them and the NF-A14 fan. 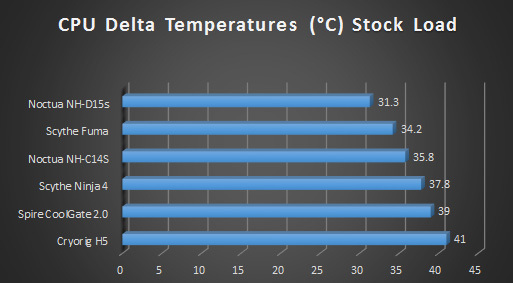 I had a great time testing the Noctua NH-C14S top-flow cooler. 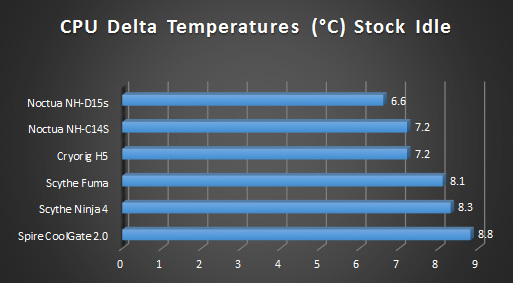 I don’t know why, but I do enjoy testing CPU coolers, there’s just something about it that I like. Must be the fact that there are so many to compare to each other or something. 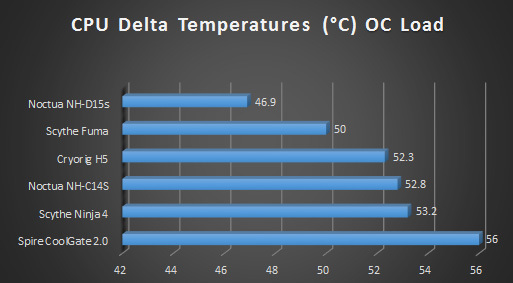 The thermal performance the C14s has to offer was great for the type of cooler it is. 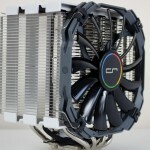 It’s c-shaped design and the single NF-A14 fan really allow for some impressive cooling. 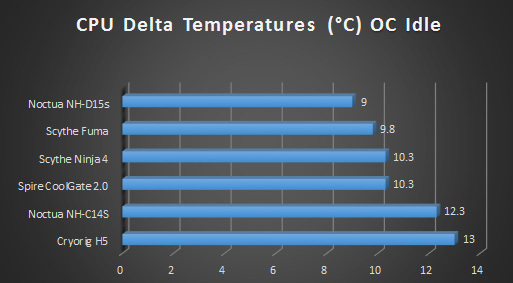 Looking back at the OC Load temperature and I was very pleased with the result. 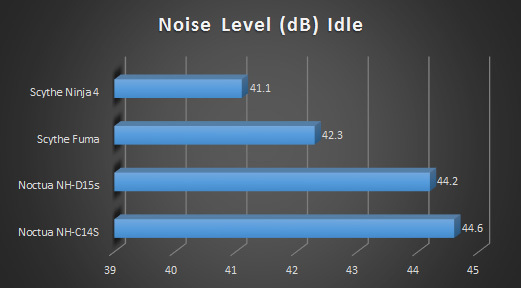 Not only would the C14S be amazing in a nice SFF build of sorts, it would also allow you to pretty much get a nice overclock on most CPU’s on the market. What’s even better is that if you want a bit better performance, this bad boy is ready to have a second fan strapped to it, which will likely result in knocking a few more degrees of the overall temperatures seen. 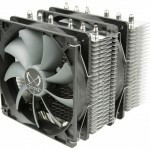 The design of the cooler itself is quite nice and its versatility is a truly great feature. 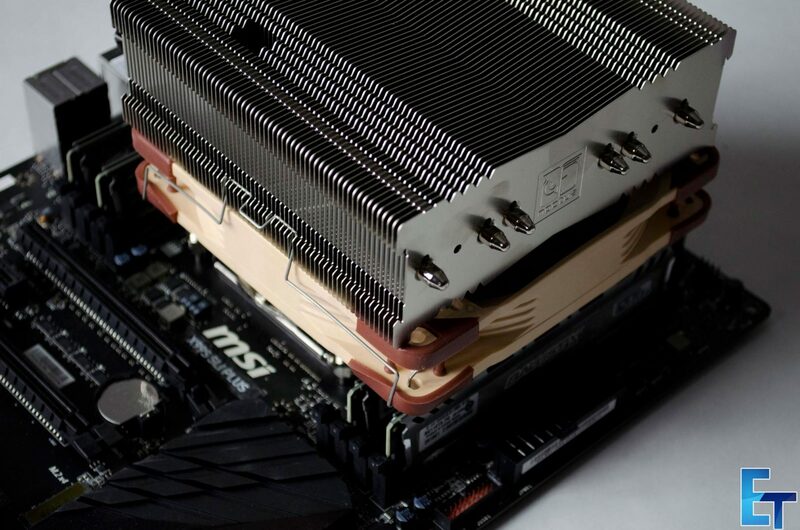 As mentioned in the closer look, if you have RAM with a bit taller heatsinks, you put the fan on the top. If you are looking to make use of the 115mm height and want to add it to a SFF build, then go ahead and put the fan on the bottom side of the fin array. 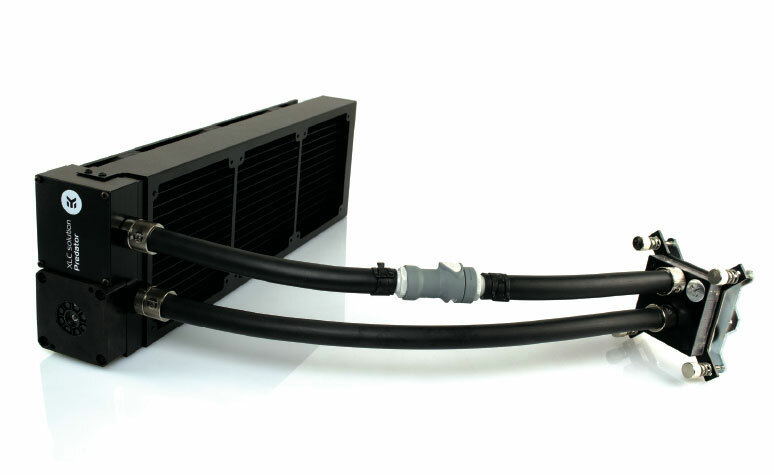 Need the best performance the cooler can offer, go ahead and put a second fan on maximum heat dissipation. Aside from that, it’s also aesthetically pleasing and is definitely something you will want to show off if given the chance. 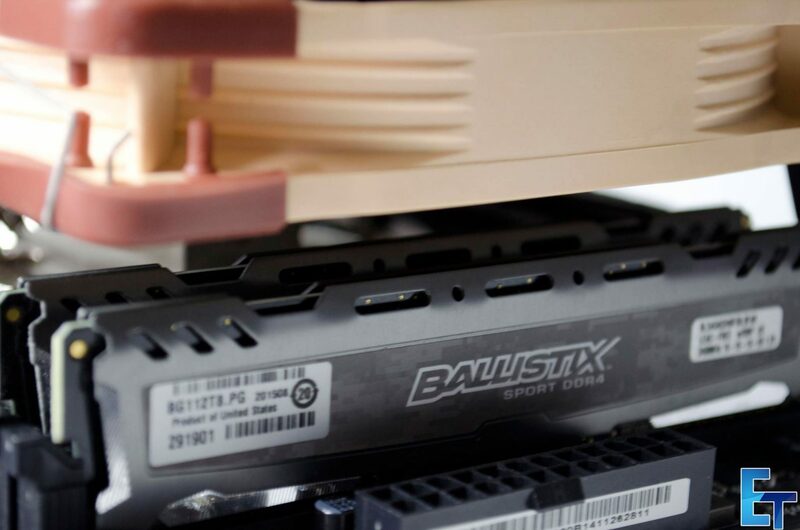 The nickel-plated copper base and heat pipes do a great job of transferring the heat from the CPU to the aluminum fins and letting the fans blow it right out of the case. Coming in at just over £60 from our friends at Scan UK, the NH-C14S is definitely not the cheapest air cooler on the block, but you have to remember all of what you are getting for your money. 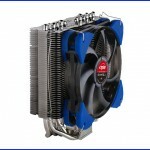 The C14s is the successor to the original C14, has a deeper fin base and offers almost as good of cooling with only one fan. 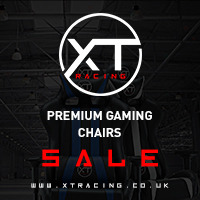 It is also designed to be compatible with a multitude of different builds and form factors and when it comes down to it all, the performance it offers is just amazing. 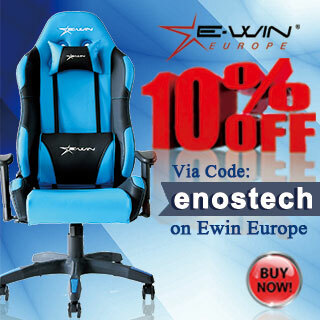 Also, when you figure the fan should last upwards of 17 years and the whole setup comes with a 6-year warranty, which equates to roughly £10 a year, you really can’t go wrong. 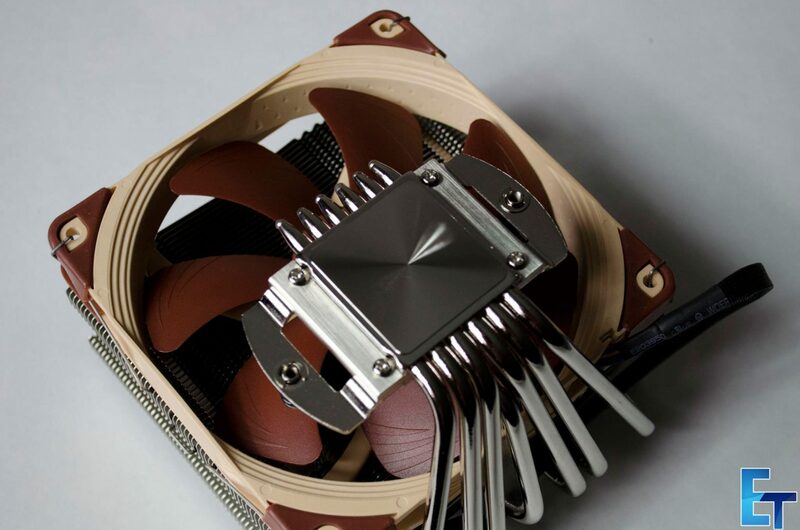 If you are in the market for a new air CPU cooler of any type, the Noctua NH-C14S should definitely be on your list of ones to look into. Not only does it offer great performance and come with an amazing warranty from Noctua, it does so while being aesthetically pleasing! 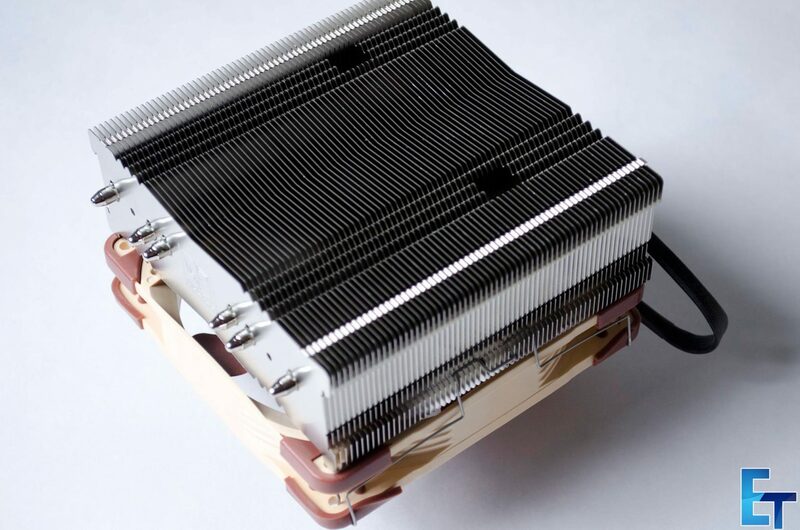 Big thanks to Noctua for sending in their NH-C14S top-flow CPU cooler for review.